A man walks into a bar... after he was just hit by a double-decker bus. This is not a set up to a joke. This is a thing that actually happened. 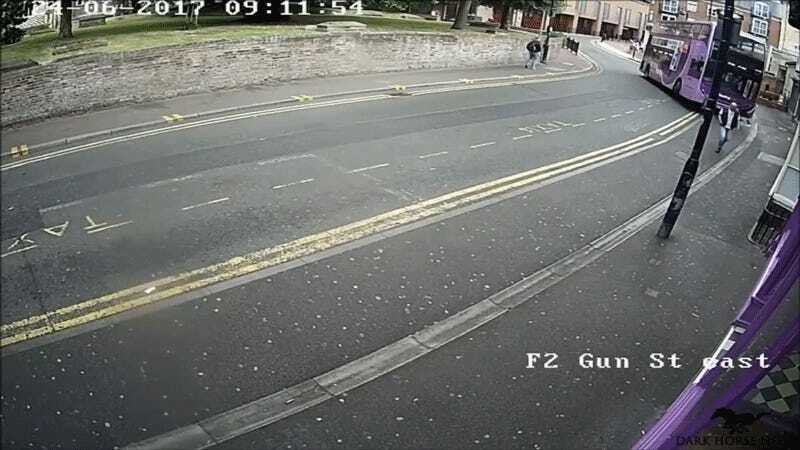 In the video, you can see a double-decker bus careening out of control and striking a man walking on the sidewalk who was just minding his own business. He gets knocked off his feet and skids for several more before getting back up, seemingly uninjured. A man was knocked down by a bus and he got right back up and walked into a bar. The 53-year-old man said he is lucky to be alive after being hit by the double-decker as he crossed the road in Reading, England. Nothing was stopping this guy from getting a pint of beer, not even a double-decker bus. My man! You are an inspiration. I feel like I would have experienced some kind of shock after this. But the call of a pint was so much more powerful than anything mortal like fear or trauma. I’m not even sure I can get on that level. I hope someone bought him a drink after that.